This sweetly scented shrublet is a real gem which not only copes with a variety of soil-types and conditions, but also provides a magical splash of colour from spring to summer. Agathosma imbricata is a resprouting shrublet with dense erect branchlets. It grows up to 1 m. The alternately arranged leaves are roundish to oval and are 1.5-7 mm long, concave above with fine hairs on margins. The tip of the branchlets bears clusters of white, pink or purple flowers with petals of 4-7.5mm long and spoon-shaped staminodes. The petals have a slender claw twice the size of the blade. The staminodes are narrow and hairy. The ovary and fruits are 3-segmented. The flowering period is from August to February. Agathosma imbricata is not threatened and has a status of Least Concern (LC). 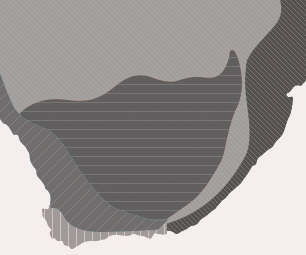 The sand buchu is common in parts of the south-western and southern Cape from Saldanha Bay to Mossel Bay. In this area it is found growing on limestones, granite or sandy well-drained or seasonally damp slopes and flats. The genus name Agathosma (Willd.) is derived from Greek agathos which means good and osme that refers to fragrance. This is meant to indicate the distinctive fragrance so synonymous with the genus. Oil glands present on the leaves and fruit normally release an aromatic fragrance when crushed. The specific epithet, imbricata, refers to the leaf arrangement and in Latin means overlapping in regular order like tiles. There are at present 150 species of Agathosma. Most of these are confined to the Western Cape. As with many buchu species, the sand buchu is abuzz with bee activities during flowering. They can be observed covering large parts of the plant as they hop from one flower to the next. 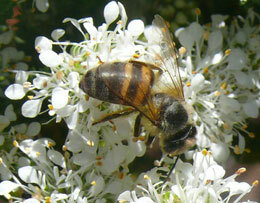 It is possible that they assist with pollination. No cultural or medicinal uses have been recorded. Planted amongst other fynbos-species, the sand-buchu is a gem during the hotter parts of the year. It also makes for a nice pot-subject. Cut back if it becomes untidy. Sow the seed of the sand buchu during autumn. Use a medium which is light and has good drainage. A mixture consisting of equal parts of sand and compost, or just plain coarse river sand, will suffice. Cover the seed with a thin layer of bark or sand and then water. Place the seed tray in a covered area that provides enough good light and ventilation. The medium must never be allowed to dry out completely or be overwatered. Germination can take between 4-9 weeks. The appearance of the first four true leaves indicates the readiness of the seedlings for pricking out. The fine roots must be handled with care. The potted plants are now placed in a shady area for 3-4 weeks to harden them before placing in the sun. This will also be a good time to pinch out the growing tips of the seedlings as this promotes more bushy growth habit. Regularly feed the young seedlings with some balanced nutrient products. Plants will be ready for transplanting into the garden after 8 to 9 months. This buchu can also be propagated by vegetative means by taking heel, tip or semi-hardwood cuttings. This is also the quickest way of ensuring a flowering plant. Take fresh material from the current year's growth. Prepare cuttings of between 25- 55 mm, remove about a third of the foliage and cut them below the node. The cuttings are then dipped in a rooting hormone and placed in trays with medium consisting of equal parts of bark and polystyrene. 2The cuttings are now placed in a mist-unit with heated benches. It takes 9-11 weeks for roots to develop. The rooted cuttings are then moved to hardening-off for 2-3 weeks. Pot the rooted cuttings in a well-drained mix and place in a shady area for 2-4 weeks to harden off. After this it can be moved into full sun. After the next 7-8 months plants can be planted in the garden. 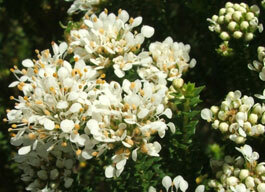 Agathosma imbricata will thrive in full sun and well-drained soil where it is planted amongst other fynbos species. The ideal time for planting is between autumn and winter which is the rainy season. Plants will then have a better chance of bcoming established in the garden before having to cope with less water or drought during summer. Plants can usually tolerate a fair amount of frost once established. Before planting, it would be best to dig over the soil, add well-rotted compost and a slow-release fertilizer. This also helps to aerate the soil. Plant the sand buchu with: Coleonema album, Elegia tectorum, Delosperma littorale, Helichrysum dasyanthemum, Lampranthus aureus, L. amabilis, L. amoenus, Jordaaniela dubia, Protea obtusifolia, P. compacta, Leucospermum patersonii, Salvia african-lutea, Perlargonium betulinum, Lobelia valida, Chrysocoma coma-aurea, Crassula dejecta, Geranium incanum and Cotyledon orbiculata. Planting at intervals of 20 to 30cm should provide enough space to encourage growth. This relative dense planting is preferred by buchus as it helps to retain soil moisture. Provide a good thorough watering during winter. In summer watering should just be moderate; however do not allow plants to dry out completely. Regular mulching also aids in keeping the roots and soil cool during summer. If regularly cut back, this resprouter can be maintained in the garden for many years. Goldblatt, P & Manning, J. 2000. Cape Plants. A conspectus of the Cape flora of South Africa. Strelitzia 9. National Botanical Institute, Pretoria & Missouri Botanical Garden, Missouri. Goldblatt, P & Manning, J. 1996. West Coast. South African Wild Flower Guide 7. Botanical Society of South Africa, Cape Town. Gould, M. 1992. The buchus: cultivation and propagation. National Botanical Institute, Cape Town. Powrie, F. 1998. Grow South African Plants. A gardener's companion to indigenous plants. National Botanical Institute, Cape Town. Raimondo, D et al. 2009. Red list of South African plants. Strelitzia 25. SANBI (South African National Biodiversity Institute), Pretoria. Stearn, W. 2002. Stearn's dictionary of plant names for gardeners. Timber Press. Portland, Oregon.